Found in FNA Volume 9. Treatment on page 324. Plants from branched woody caudex. Stems decumbent, becoming suberect, 1.5–5 dm (in fruit), 4 mm diam. ; branches erect or leafy. Leaves (crowded at bases of stems); stipules absent; petiole to 4 cm; blade 3–15 cm, leaflets 6–10 per side, gray-green (at least on dried specimens), ovate, 4–10 mm, pinnatisect, lobes 3–7(–11), linear, margins revolute, apex penicillate (having a little brush or tuft of hairs at tips), abaxial surface sericeous, adaxial sparsely pilose. Scapes terminal, to 50 cm, 1.5–3 mm diam., sparsely pilose, proximal scape and leaf sheaths with multicellular hairs among 1-celled hairs, with (0–)2–3 cauline leaves to 10 cm. Inflorescences 15–35-flowered, interrupted spikes, (flowers crowded distally, 2–15 cm in flower, elongating to 50 cm in fruit); bracteoles leaflike to linear, ciliate. Flowers 6 mm diam. ; sepals 4–5, elliptic, 3 mm, abaxially pilose, adaxially glabrous; stamens usually 4, filaments 2–3 mm, anthers dark red; stigma rose, laciniate. Fruiting hypanthia ovoid, 3–4 mm diam., surfaces tomentose, obscurely 4-angled, bearing 10–20 spines in longitudinal ranks, to 3[–4] mm, spines with retrorse hairs or barbs. Calif., South America (Argentina, Chile). 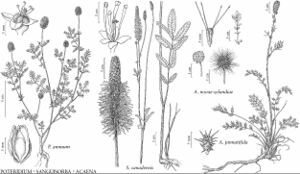 Herbarium records indicate occurrences of Acaena pinnatifida between Santa Barbara and Sonoma counties. This page was last edited on 2 January 2019, at 22:36.